My old hand-me-down laptop is getting too slow under Windows. I tried reinstalling, and it’s still slow. Perhaps it’s the patch upon patch upon patch that needs to be applied to make it safe that explains why Windows installations always slow down over time — and why reinstalling didn’t solve the problem. So I went looking around for lightweight Windows-like Linux distros… and ended up with LXLE. The steps were pretty simple. Windows Disk Management to shrink the main partition enough so there was space for Linux. Boot onto the USB and follow the steps. Easy. The laptop seems rejuvenated. The speed is nice. I mostly use it for web and a little word processing (which Libre Office, installed with the distro, should cover). And if I desperately want something in Windows, I can still boot it up if I need to. 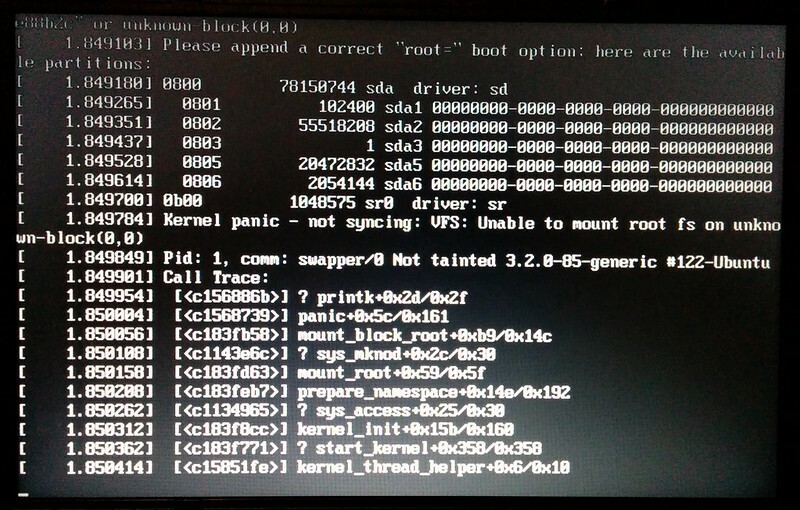 It has had some problems with waking up after sleep, and forgetting the touchpad No Click setting when rebooting. The whizzes on Twitter suggest it might be a hard disk corruption… which it might be, though Windows is still booting fine. Or it might be that grub needs reinstalling. I’m not even sure how or why I’d do that. The other suggestion people have is to try a different (more stable?) distro, such as Lubuntu. Might be worth a look, though I’m wondering how much better it would be. As I get time I’ll keep testing. Update: It may have been to the partition running out of disk space. Yeah, seems like an odd way of dealing with it. This entry was posted in Linux, Windows on Tue 2015-06-16 by daniel. I don’t expect miracles in the command line, but I do expect that if I’m told more help is available, that more help is actually available. This entry was posted in Windows on Mon 2014-12-08 by daniel. 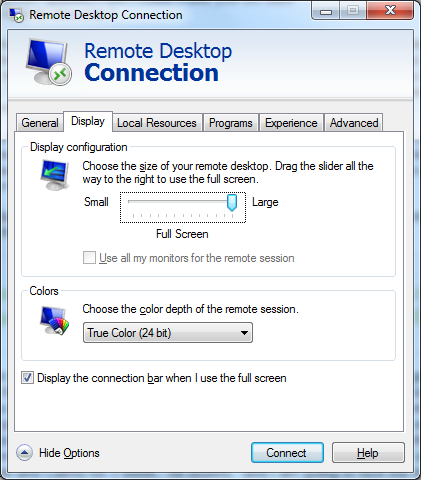 Why can’t you resize Remote Desktop windows? If you can spontaneously change the resolution of Windows in a Virtual Machine, how come you can’t do it in a Remote Desktop session? I’m forever opening up RDP sessions in the wrong resolution, because the RDP client seems to have a funny way of selectively remembering (or forgetting) the preference. Sometimes if focussing entirely on the remote session, I’d like it to be full-sized. At other times I’d like it smaller so I can more easily jump between things. Is there something complicated that stops RDP windows being resized after connection has been made? If it is possible in a VM, presumably it can’t be too hard in RDP? It looks like in Windows 8 and later you can easily turn on “smart resizing”, and in earlier versions this can be configured in the .rdp file. But this scales the window at the original resolution, rather than changing resolution. It’d be nice if proper resizing of the window was possible. This entry was posted in Windows on Wed 2014-11-12 by daniel. Despite my best Googling, nobody seems to have had quite this problem (and written about it). Error Stack:System.InvalidOperationException: Failed to handle request. —> System.InvalidOperationException: Unable to handle request. —> System.Configuration.ConfigurationErrorsException: Invalid token. —> System.BadImageFormatException: Invalid token. I tried adjusting the .Net version — turns out it would work fine in 3.5 or lower, but broke in 4 or higher. My machine itself was okay — creating a new 4.5 web site with just a web service in it worked fine. In the end the solution was to create a new web site and add the individual pages back into it, leaving out the Bin directory. I rebuilt that by adding references to the various DLLs back one by one. Something in the old Bin directory apparently was throwing it out. This entry was posted in Windows on Fri 2014-06-06 by daniel.